Spectacular remodeled home, solar-powered w/views & glorious outdoor entertainment area in the coveted Del Cerro school system! Quality craftsmanship thruout featuring Brazilian cherry wood floors, granite counters & mahogany-framed front doors w/custom glass inlay. 4 bedrooms inc. master are upstairs w/optional 5th downstairs. 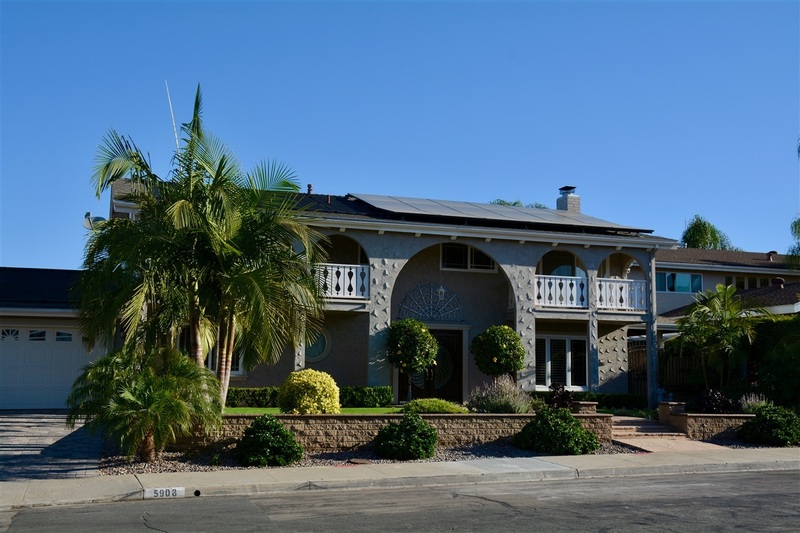 Vinyl, dual-pane windows, newly remodeled kitchen, huge saltwater pool & spa, stunning waterfall, jumping rock & palapa outdoor kitchen w/built-in gas BBQ, bar,fridge & kegerator!, Immaculate home, shows like new! Views to the west from the back upstairs and sparkling night lights view of the Del Cerro hills from the front balconies. Peaceful neighborhood and highly-sought-after schools, Del Cerro is the place to be and this home spells FAMILY FUN with its amazing saltwater pool, spa, waterfall, jumping rock and outdoor palapa kitchen! Pool, alarm system and garage door all have wifi-enabled controls. Nightime lighting in front and back looks like a landscaper's masterpiece! Must see to fully appreciate!